Last Saturday night there was a Texas-style barbeque worthy of a scene in the classic motion picture, “Giant,” but it was so much more than that. One could sense the presence of both the new money and the old under the huge catering tent that had taken up residence across the entire street in front of Conroe’s Crighton Theater for a fund-raising concert and dinner billed as Bach, Beethoven & Barbecue. Guests had paid $125 to enjoy the delicious pre-concert dinner by Texan Barbeque & Catering with flowing wine & beer, as well as an after-party for champagne, coffee, dessert, and a chance to meet the concert stars at the end of the evening. Invitations had recommended attire from “Jeans to Jewels,” so there were plenty of cowboy hats and boots around, while diamonds and Rolex watches flashed in abundance. But these “just plain folks” from Montgomery County weren’t there to show off their wealth. 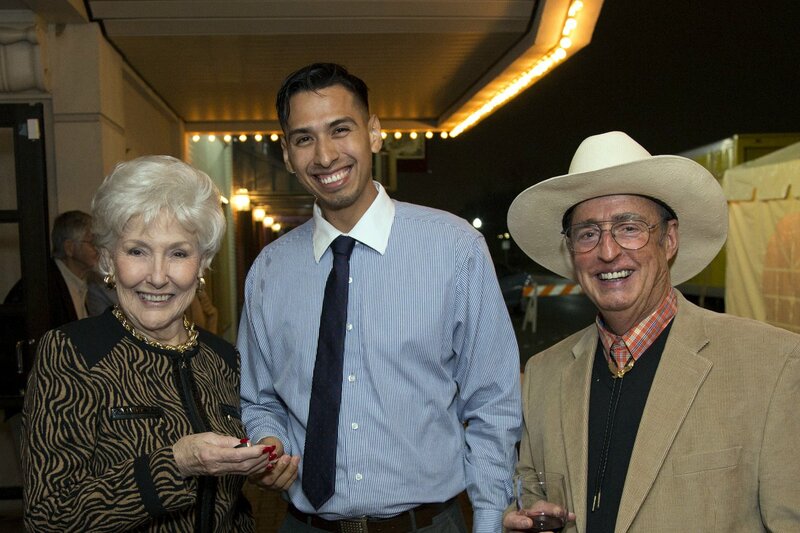 They had turned out in large numbers to support a uniquely worthy cause, the annual Concert of Finalists for the Young Texas Artists Music Competition (YTA), sponsored by the Montgomery County Performing Arts Society. Now in its 30th anniversary year as the crown jewel of the MCPAS season, the event is an official State of Texas music competition. 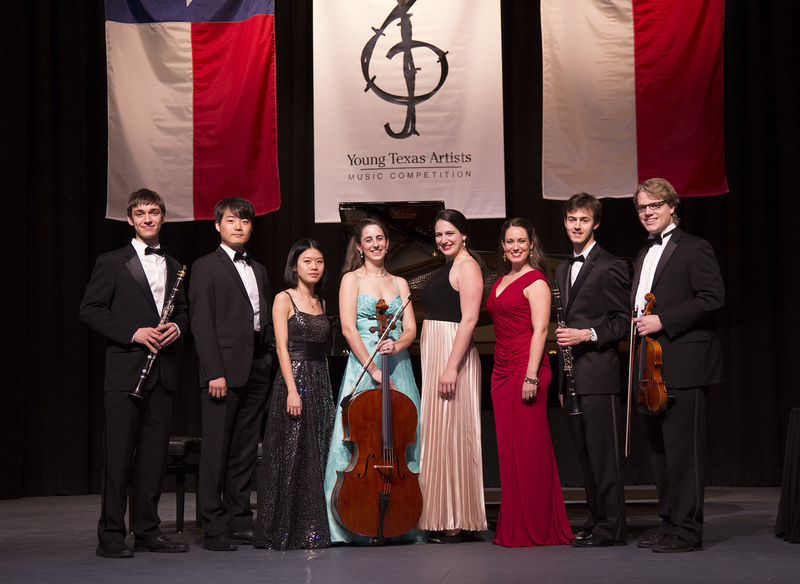 The young musicians competing in the weeklong competition must be either Texas residents or students studying classical music in Texas. This gala concert presented performances of the eight finalists, two each in the four categories of Strings, Piano, Voice, and the catchall category of Winds, Brass, Percussion & Harp. Susie Pokorski again served as Chair of this year’s event, and Emelyne Bingham served as Artistic Director. 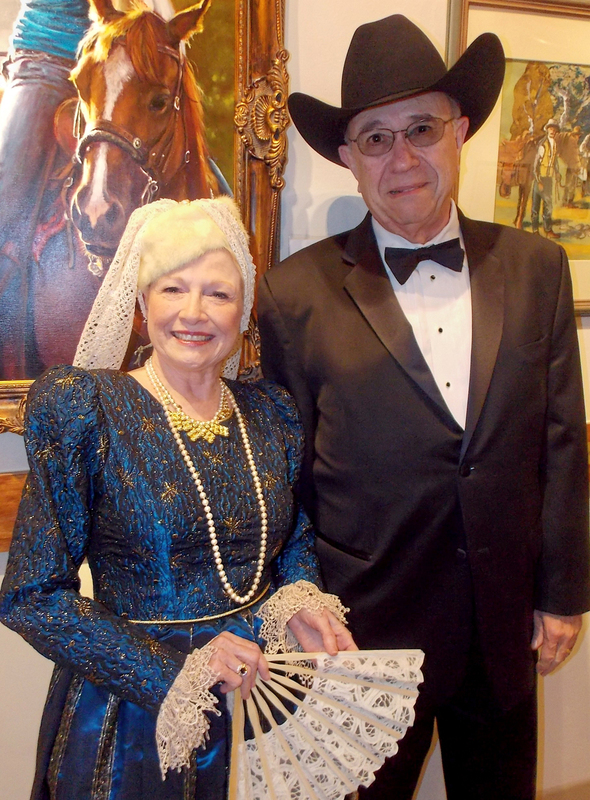 Special honorees for this 2014 edition of the competition were longtime YTA supporters, Carol and Dr. Douglas Aycock. Before the concert got underway there was yet another competition. As an additional fundraiser for YTA, this one involved the dinner guests bidding for various exciting donated items during both silent and live auctions. To add to the excitement, a group of local merchants had joined forces and agreed to match, dollar for dollar, all new and increased contributions, made to this year’s Young Texas Artists Music Competition. Those merchants included Streater-Smith Honda Nissan, Wiesner Buick GMC, Buckalew Chevrolet and the Gullo auto dealerships. Barbara Bouma receives the car keys from Sewell Maserati Rep, Miguel Alvarado, as David Dow Bentley looks on. Sewell Maserati of Houston had donated to the auction the use of their brand new model — the Maserati Ghibli — for a Friday thru Monday “weekend-of-your-choice” to the highest bidder. During the bidding on that item I had quite a scare when the auctioneer loudly announced, “SOLD for $1,450.00!” and appeared to be staring directly at me. Little did I know that my guest for the evening, Barbara Bouma of The Woodlands, had been quietly giving subtle hand gesture bids while seated right beside me. Hers was the winning bid. Then it was on to the main event of the concert competition, emceed this year by St. John Flynn from KUHA 91.7fm, along with special guest and classical pianist, the very lovely Jade Simmons. Her charm and poise as a former 1st Runner-Up for Miss America (2000) was evident as she interviewed each contestant. In this year’s Piano category the silver medal and $1,000 prize went to Jun Cho for his performance of Prokofiev’s Finale: Allegro Tempestoso from the Concerto No.2 in G Minor, Op.16. From the fierce opening passages, Cho brought breathtaking skill and thunderous waves of energy to his powerful performance of the difficult piece. The gold medal and $3,000 prize in this category went to Hui Shan Chin who beautifully performed the Andante and Presto from Mendelssohn’s Piano Concerto No.1 in g minor, Op.25. Dressed in a shimmering black & silver gown, her slender arms and the smooth, fluid motions of her delicate attack made her appear to almost be floating under water during the Andante. 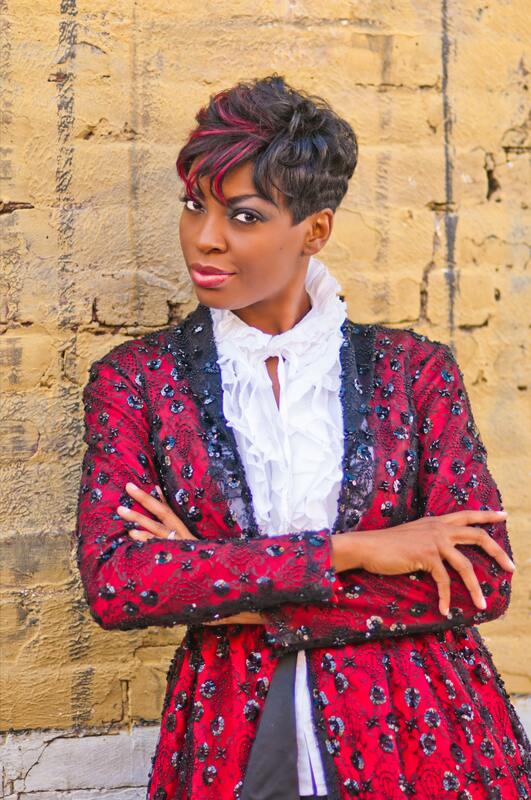 Her wondrous, rapid-fire dexterity and intensity of focus made for a thrilling Presto finale. In the Winds, Brass, Percussion & Harp category, the two finalists this year were both clarinetists. Graeme Johnson captured the silver medal and $1,000 prize as he displayed the seductive body language of a Pied Piper while casting his spell with the haunting beauty of Debussy’s Premiere Rhapsodie. Winning the gold medal and $3,000 prize in this category was Nicholas Davies for his performance of both Schumann’s Fantasiestücke, Op.73, and Stravinsky’s Three Pieces for Clarinet Solo. With boyish charm and evident youthful enthusiasm, he had demonstrated a fluid and intimate mastery of the instrument, along with a great range of virtuosity. In the final Strings competition Philip Marten would take home the silver medal and $1000 prize for the smooth elegance and technical skill in his performance of the Allegro moderato from Prokofiev’s Concerto No.2 in g minor, Op. 63. His lashing virtuosity and crisp dexterity were clearly evident in capturing the many moods of the complex work. The gold medal and $3000 prize in this category went to Lovely Emma Hoeft. Adorned in a beautiful gown of pale pastel blue/green, she would win over the judges with Tchaikovsky’s Variations on a Rococo Theme for violoncello and orchestra, Op.33. The gentle sweep of her nodding head and long brown hair seemed to echo the brisk moves of her bow across the richly resonant instrument with which she clearly had an intimate connection. The audience was impressed as well, interrupting with applause before the performance was over, and later voting her the additional $1000 Audience Choice Award. The last category of Voice found a silver medallist in beautiful soprano, Julia Engel, winner of that $1,000 prize. Dressed a soft and elegant floor length gown of cranberry red, she first offered an animated, joyous and theatrical, Sul fil d’un soffio etesio from Verdi’s Falstaff. That was followed by her dramatic depiction of the desperation of love lost as she performed the aria, “No Word From Tom…I Go to Him,” from Stravinsky’s opera, The Rake’s Progress. 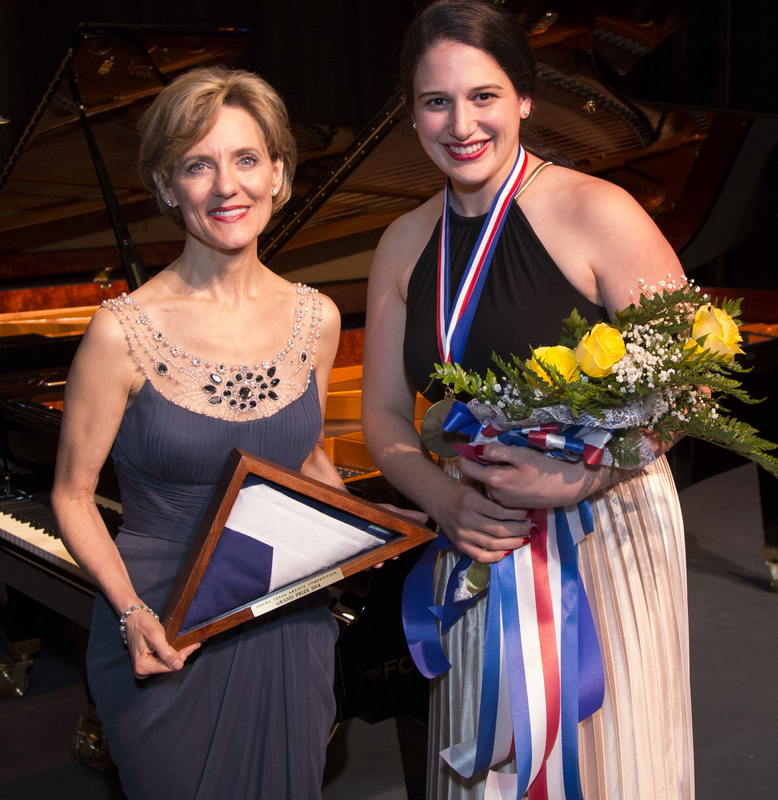 The gold medal and $3000 prize for Voice was awarded to mezzo-soprano, Allegra DeVita. Dressed in a pleated and cream-colored gown, she first delivered a fiercely authoritative, Tu preparati a morire, from Handel’s Ariodante. That was followed by a powerful performance of Parto, parto from Mozart’s La Clemenza di Tito. The distinguished panel of judges (Elizabeth Buccheri, William Florescu, Miyoko Lotto, Bradley Mansell & Becky Tobin) was clearly impressed, and then awarded Miss DeVita an additional $3000 as the evening’s Grand Prize. This entry was posted in BroadwayStars.com, Concert Reviews, Conroe Courier, Crighton Theatre, Houston Community Newspapers online, Jade Simmons, Montgomery County Performing Arts Society, St. John Flynn, The Courier Columns, The TICKET, ThePeoplesCritic.com, Young Texas Artists, YourHoustonNews.com and tagged Classical Music, concerts, Conroe, Crighton Theatre, Jade Simmons, St. John Flynn, Young Texas Artists. Bookmark the permalink.